The first time I did it I literally started from home and cycled to the local station with everything I thought I needed rammed into a very small rucksack. We found our way to Manchester Piccadilly, then Euston, then St Pancras and (after a lot of faffing) onto the Eurostar and across to Brussels. The challenges continued, looking for alternative routes when the originals turned out to be dead ends, or simply didn’t exist in the first place. Some of the major roads were downright frightening, and we bit off more than we could chew distance-wise a couple of times, just about crawling into the hotels at night. The bikes tended to have to share our bedrooms as there was nowhere to store them. Even so, it was a fabulous experience, and we returned to Holland for another cycling holiday the next year – and by then we’d discovered bike boxes and EasyJet. This made some of the logistics more straightforward, while it also brought new problems, like how to transport and store the boxes…There are some bike tour outfits who’ll arrange luggage deliveries so you can focus on your cycling, which are worth investigating. We tried some other places after that, including Portugal. It’s great to be able to explore at your own pace and have the adventure of discovering new routes for yourself, although I’d have to say along with the logistics the biggest frustration was not really knowing how to make the most of the areas where we were riding. That was one of the reasons I ended up founding Flyingeese. Self-guided cycling is a great thing to do, but I did spend a lot of time in the saddle thinking about what my ultimate cycling experience would look like – and I must admit, it didn’t include much in the way of having to deal with research and practicalities. For me, the number one thing was wanting to be in great and varied terrain (preferably with an iconic climb or two – those are a bit thin on the ground in Holland…), and to be with people who could make sure I got the best it had to offer. There’s no substitute for local knowledge. Then it was a question of what else I didn’t want to worry about. A proper support vehicle would be handy for mechanical and nutritional reasons alike, and it would be good to be able to use pro gear and have someone else do the maintenance at the end of each day. At that point I’d feel more like a cold beer and a warm pool, and I’d want to know a sumptuous meal was lined up too. And yes, I’d want a luxurious, peaceful base with particularly comfortable beds. So that’s what we ended up creating with Flyingeese on the Algarve. My favourite trips of all these days are ones I take with my own company! If you’re on a budget and are looking for adventure and something that will definitely be a life experience, then I’d certainly encourage you to have a go at a self-guided trip. 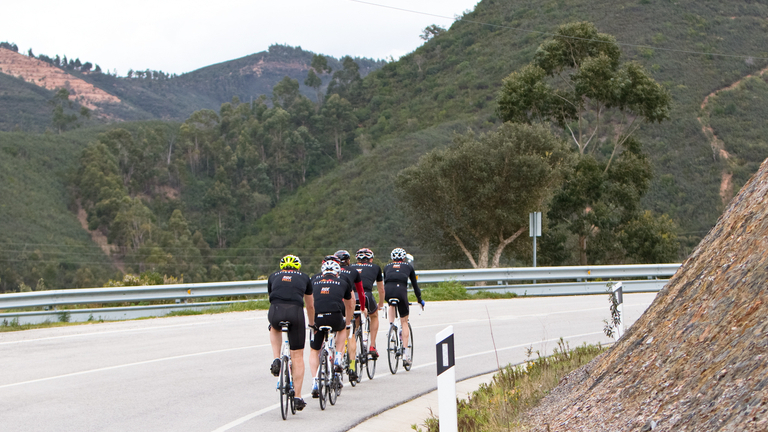 But if you’re looking for an unforgettable cycling experience that really feels like a holiday in and out of the saddle, a guided cycling holiday is the way to go.